We sat down with Ashley to ask her some questions, find out her answers below! How does it feel to be back at Visions as the Keynote Speaker, and what did you learn from your time in Visions 5 that has helped you with your current career? It feels so surreal, but what a great honor. I’m really excited to be back and see the rising talent and what you guys (V9 Staff) have put together. In V5 I was the Video Race Co-coordinator. It was super intense. We did so much preparation, but on the day of the event, everything was different. We had to make quick decisions that weren’t necessarily with the plan we had made. We had to think on our feet. The film business is exactly that, you can plan and plan and plan, and then when you start whatever it is that you’re doing, it changes completely. You have to be adaptable, and that’s one of the things Visions taught me. You can rise to the occasion and even exceed expectations when you just come in with an open mind. What is something you wish you knew in school that would have benefited you once you graduated? I wish I knew the amount of time being in the film industry takes. In the film industry, a 60 hour weeks is the bare minimum. For me, I came out of college with the expectation I’d be working nine-to-five like hours, but last week I worked 85 hours and all seven days. The reality is that film takes way more time. Part of what I’ve been trying to do in the last year is find balance, because if you don’t find outlets and avenues to just do things that make you yourself you will surely crumble. For my self-care routine, I read a lot. I listen to podcasts like The Healing Circle and Super Soul Sunday. I also do meditation and yoga. What do you do as a Producer’s Assistant, and what does your day to day look like? My day can look like anything. The goal I set out to do every day is make sure my boss has everything he needs because producers are wildly busy. It’s helping them maintain their schedule and sometimes assisting with personal things. On Doctor Sleep I did so many things, I managed our internship program. I was also Co in the Art Department so I assisted with orders and sourcing clips we were going to use in the movie. The job is specific to the needs of who you’re working with. How did you work your way up from a Production Assistant to a Producer’s Assistant? The biggest thing is connections. Networking is this business. After I just graduated college, I was approached by Shannon Silva to work on an ABC pilot (never aired) that was shooting in Myrtle beach for two weeks. A connection from that show knew a production coordinator that was doing a job in Atlanta. I did a Skype interview, got the job, and moved to Atlanta. I did that job and the Assistant Production Coordinator brought me with her to the Baby Driver reshoots. And from there it spirals. (21) You meet this person, you meet that person. When you’re looking for work you can just find those avenues reach out to people, send your resume. It starts spreading by word of mouth. That’s why making a good first impression on people is super important! Buy your all-access badge now to hear Ashley’s Keynote address at Visions 9 Film Festival & Conference April 11th-12th to learn more about how you can achieve your dreams! We sat down with Michael to ask him some questions, find out his answers below! What do you do as a Senior Writer/Producer at HBO? It’s a weird job title. But it’s more of a producing editing job.I oversee cuts, I work with vendors on cuts, and I edit as well. I edit my own stuff and cut my own projects. I do some producing with that too. Because it’s not just me cutting. I have to work with people in-house, get the footage in, talk to the legal department, music, and all that stuff to try to get my own cut handled. How did you go from college graduate to Sr. Writer/Producer at HBO? I graduated UNCW, and I was like where do I go what do I do? I took a job with a fellow UNCW graduate in North Carolina making corporate marketing videos, and I was like this is killing me. This is not what I want to do. So I took the leap of faith and moved to Los Angeles. I had no job prospects at all. But I had a plan at least. I’m gonna start in the trailer industry and apply to every trailer house out there and get a job as either a runner or Assistant Editor. Michael’s plan proved to be successful. One month into his LA move, Michael was hired by Workshop Creatives as a runner. He then worked his way up from runner to Assistant Editor to Editor and eventually got a job as an Editor for Ignition. Later, Michael was approached by HBO and found himself making the move from LA to NYC. It’s just that drive. I don’t know what else I could be doing right now. It’s a weird thing. I have to do film. There’s nothing really else out there for me to do. If you’re struggling that’s film. If you’re struggling, and you’re not enjoying the fact that you’re struggling, then you shouldn’t be in film. Your life is going to be hard. Your life is going to be a struggle. It doesn’t get better. Even the pros are always struggling and grinding trying to make their vision come to life. You just get a bigger budget and more money to play with. Which is fantastic, but you still have that pressure on you. What was it like creating Flat, and what are you working on now? That was fun! Once you get out of school unless you’re very close with people it’s hard to keep those films going. After I got out of UNCW, I didn’t make another film for 3-4 years. But I finally built a network and made a film out in LA. The first one was A Slight Hiccup. It’s a funny little thing. It was an interesting experience because I was just the director and not the writer. But for Flat, I was the writer and director. It was an interesting process. It started off as this little project, and then I brought people in and it kind of spun out of control. It was a case of too many cooks in the kitchen. The lesson there was stay true to your vision. In the end, it was pretty successful. It’s been in a few festivals and picked up a little attention. Nothing too crazy. Have your own question to ask Michael? Buy your all-access badge now to ask him yourself at Visions 9 Film Festival & Conference April 11th-12th! We sat down with Jing to ask her some questions, find out her answers below! I get up around 7 to do an hour or two of writing. Then I meet with someone to get a morning coffee and talk about projects that are on the horizon. After lunch, I spend the next portion of my day working on completing projects or pitching new film projects. And I end the day with a tea at my neighborhood teahouse with another friend who shares my creative and professional interests. These days, I’m putting a lot of focus on meeting folks. Why is it important for you to structure your day around creating? Every artist struggles with completing a product. I don’t have a problem with it, but it stresses me out if I’m not focusing on what I want to be doing. That’s why I prioritize writing first thing in the morning before I spend my day working on something that I’m hired for. My goal for this is to finish another short film and write my first feature. If I don’t do the daily steps to get me to my goal I’m going to get stressed out. That’s what keeps me inspired, so it’s what I need to do every day. And it is hard to get up early and commit to 1-2 hours of writing every morning, but it’s the most exciting part of my day. How would you describe your creative voice? Right now I make a lot of films that feature women. Specifically, women who grow up in diasporas. My films have a speculative nature. Meaning they’re not exactly reality. There’s another layer like fantasy, sci-fi or something. Another layer put onto reality I would also say my voice is very grounded in my cultural background which is like a very hodge-podge background of growing up in North Carolina and in the south, but in a very diverse community because I grew up in Durham. I was born in China, so I do draw on my Chinese cultural roots but there is also this layer of multiculturalism on top of that. I think that’s my voice. What was your experience like creating The Traveler Takamure? It was a pretty big project. It took me 4 years and I consider it my rite of passage. The Traveler Takamure was my first chance to make outside of the context of school. Meaning that instead of my teachers just being the audience, I was aiming to share this film with the rest of the world. The most important thing that this film taught me was how to develop discipline. I was working a fulltime job, and I didn’t have any creative community to support me. It really felt like I was working on it forever and doing it alone. I’m just proud that I finished it. Four years is how long it would take to make a feature and it was only sixteen minutes. It was a total labor of love. I was my own manager and collaborating just with myself. It was really hard, but I finished it. What did you learn in undergrad and what do you wish you knew? I wish I knew that school wasn’t going to teach me everything that I needed to learn. Especially with Millennials and Gen X folks, there’s so much pressure to know exactly what you need to be doing. And I was working so hard in school to follow those parameters, but now I don’t do what I learned in school. It helped me for sure, but there’s nothing like just going out and doing it! The most important thing I got out of school is learning how to be a public speaker and how to communicate my ideas. It takes a lot of work to translate the ideas that are already in your head to something that other people will understand. The other thing it helped me with is forming relationships. Focus on people and take the time to work on projects that aren’t just you. Take the time to experiment. Because you’ll never have that environment again where there’s no risk. Have your own question to ask Jing? Buy your all-access badge now to ask her yourself at Visions 9 Film Festival & Conference April 11th-12th! We sat down with Kevin to ask him some questions, find out his answers below! What was it like completing your first feature film Reading for Sarah? When I made shorts in college I would just cringe the entire time watching them. It’s not that they were bad necessarily I wish we did everything differently. For once in my life even though it’s five times the length of anything I’ve done before I don’t feel that way. I’m proud of it and I want to show it to more people. It’s absolutely been a turning point in my career. I’m glad I just did it. Why would I wait for permission from somebody else? Why would I want to wait until I had 50,000, dollars, 100,000 dollars, or 7 million dollars on a movie when I could make the same thing with 5,000 dollars and with a bunch people who are hungry to make something good. Something important. Why bother waiting anymore? What’s stopping me? What advice would you give undergrad filmmakers? Watch as many movies as possible? You never know when you’re going to hit on the right thing that strikes a chord with you and decide, “Wait I want to make movies like that person.” When you see enough your style becomes a mold of everything you’ve seen so it’s not just copying one person and people don’t write you off as a ripoff. I think another important thing is really working with your actors. For Reading for Sarah, we had four segments always shot over the course of two days. And there were two actors for each segment. And what we did is have at least 5 days of rehearsal for every single segment. Not only so they could memorize the script so we could adjust the script adjust the dialogue to the point they’re comfortable. If it sounds off when they’re saying it on set it’s not going to sound right with the finished product. Learn to talk and work with your actors. How do you find a balance between critical studies and film production? I hate the fact that there are basically two sides to it. People categorize critical studies for people who want to teach or become film critics or spend their life writing about film and I love writing about movies too, but the reason I study film is so I can study what has come before me and use it as an influence moving forward. Forme cinema is the greatest art form because it synthesizes everything that’s come before it--literature, theatre, music, picture, moving picture, editing. It’s just so many mediums meshed into one I can’t imagine anything else like it. So I love watching movies and taking a closer look at if this film makes me feel this way, why does it make me feel this way? I think that’s something a lot of people take for granted. Until you start to understand that, you’re not going to be a solid filmmaker in my opinion. I think the truly great ones know how to use the medium to get a certain reaction out of people. Have your own question to ask Kevin? Buy your all-access badge now to ask him yourself at Visions 9 Film Festival & Conference April 11th-12th! We sat down with Hannah to ask her some questions, find out her answers below! How did your time on staff of Visions help you post-graduation? I cannot articulate how much it has helped me! I was the Hospitality Director during my junior year and Managing Director my Senior year. Honestly, had I not had Visions my last two years of my college career, I don’t think I’d be on the same path I am now. Before that, I was just floating not knowing what I wanted to do, but being pushed to be in those leadership roles and learning about all the jobs you can have taught me so much! Having Shannon and all of my professors as connections really helped me get to the point in my career where I am now. I knew I kind of wanted to be work in documentary. I also had an interest in editing, producing and film festivals. But I also wanted to do something that would make a difference in the world. I didn’t even know companies like Working Films existed. Then Shannon reached out to me, told me they were hiring and connected me with them. Working Films focuses a lot on environmental and social justice causes, how does that align with your own passions? I started having a passion for social and environmental justice more my senior year of college cause I finally got to jump into my documentary senior seminar where I got to make Dead in the Water a documentary about factory farms in North Carolina and how they affect the communities around them. That really opened my eyes to what issues are happening locally. So diving more into these issues with Working Films has been amazing. One thing we really focus on is accountability filmmaking. So not just coming into communities just to film them, tell their stories and leave but give them agency in the process and make documentaries that are authentic, true to the communities and have them involved in all of the processes before, during, and after production. What is your day to day like at Working Films? It’s very busy. All the time. We have a 5 person staff including our 2 co-directors and we have what feels like a million and one projects going on. Which is exciting, but a lot of work! My daily work can literally be anything from organizing community film screenings, designing agendas for different meetings, watching films, reviewing them, coordinating logistics. The work varies. It’s been a dream here. Through the different projects and programs, I’ve been able to travel to Atlanta, Detroit, LA, New Orleans, and Amsterdam. What are your Long Term aspirations? I’ll work for Working Films for as long as they’ll let me. If I can figure out how to balance it, my long term goal now is to make documentaries or produce documentaries while working full time because I do miss being able to be on the set of something. I like to see people who don’t have much of a voice or who aren’t given a platform to have much of a voice being represented and empowered to tell their story. Tell their truth. I want to see a more just world where people are kinder to each other. Have your own question to ask Hannah? Buy your all-access badge now to ask her yourself at Visions 9 Film Festival & Conference April 11th-12th! We sat down with Caleb to ask him some questions, find out his answers below! What did you learn you at UNCW and how has it helped you get to where you are now? I was given a lot of freedom at UNCW to explore what I wanted to do. The job that I have now, is a job I didn’t even know existed until after college. It’s interesting because I feel like I was working up to doing this before I even knew it was a thing because of the amount of freedom I was given. Whether it was in class or the sheer amount of support I was given to just try new stuff. I was never chastised of wanting to pursue a new mode. I was given continuous freedom and support to do the things I wanted to do! I was never stifled in either studies or production. I’m the acquisitions coordinator for the Orchard [now known as 1091] based in Los Angeles. We’re a global film distribution company that started as a music company over 20 years ago and about 5 years ago we shifted into film distribution. My job is to work with the acquisitions department, there’s four of us on the acquisitions team, we work collaboratively to track scripts, attend festivals, work with sales agents to track projects domestically and internationally, and work with our sales and marketing teams to acquire films that are independently produced and release them on a global platform. Every day is so incredibly different. There’s never just one thing I’m doing. What advice would you give someone trying to pursue film distribution? That’s the thing, I can only speak from my experience. I know so many other people who have all had different trajectories to get to an acquisitions job. Mine was working film festivals, and I made a lot of good connections through that. My career pretty much started through film festivals. You get to meet a lot of people who work in distribution, filmmakers and otherwise. I got my first job at a distribution company because I went to UNCW with someone that worked at that company. My biggest piece of advice as far as making connections and seeing if this is going to turn into a career for you, never pass up on an opportunity to meet someone new or work with a group of people you’ve never worked with before. I worked really hard to maintain those relationships I made, and I’ve never looked at any of those relationships as a chance to network or build my “circle of influence.” I truly look at them like friendships and those are the relationships that matter more. Stay informed, maintain these relationships, and constantly have your ear to the ground as far as what’s going on in the industry. Have your own question to ask Caleb? 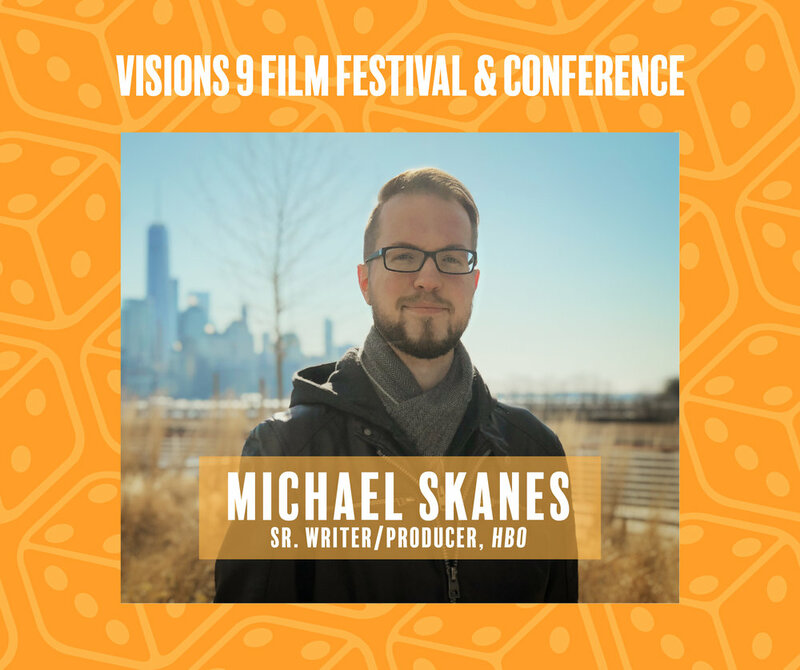 Buy your all-access badge now to ask him yourself at V9’s Visionary Panel April 12th!